This past year Xlibris Press published the final collection of poems by Karl Patten. The book is entitled The Obstacle, and my intentions with this piece are to highlight the book itself and to pay tribute to a “less-known” poet who spent over forty years as a writer, professor, editor, translator, and community activist in Lewisburg, a small town in central Pennsylvania—the home of Bucknell University where I received my undergraduate degree in 1999. In those years, I had to walk past Karl’s house on South 3rd Street to get to my beat up old undergraduate apartment where the nightstands were milk crates. From the street, without fail, you could see Karl at the window curled over his desk, the outline of his beard, the movement of some book in his hands. If you watched long enough, you could even tell whether or not he loved the book he was holding. In the late spring semester you could even hear the quick clicks of his typewriter, which he used religiously until he died this past April. He has been writing me letters on his typewriter since I left Lewisburg in 1999. 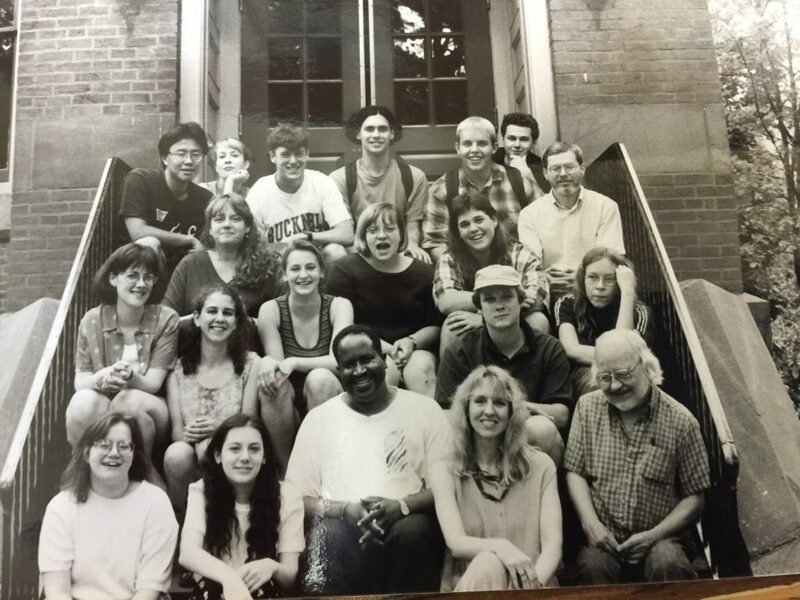 I should say that because I was queer and not particularly well-dressed or properly “upper-middle class-looking,” I didn’t make friends easily at Bucknell. Karl ended up being one of my closest friends in those years. His office a safe haven from the homophobic epithets hurled from fraternity house windows. In the small courtyard of my favorite building on campus, the Stadler Center for Poetry, Karl and I would smoke cigarettes, talk about baseball and writing. Karl Patten was born on the same day of the year (February 28) as my mother, and the truth is that in my college years he was a kind of father to me. He even showed up at a few of my softball games. He understood me somehow—that sports and poetry were not opposites, that I was neither a man nor a woman, that the small town we were in was at once the most wrong and most right place for me to be. He taught me about iambs; he taught me how to breathe a line break; he taught me that a poem was just like a place, and that its music could not be pulled apart from its content. He once dared me to stop writing about my own life for a month. He once told me (in response to my saying I “didn’t like formal poetry”) that I couldn’t get an A in his class unless I wrote 10 sonnets that week. He grinned what seemed like beyond his beard when I brought him the sonnets. He read all ten of them in front of me in his office; he grunted; he smiled once or twice. I loved him. He was the fullest kind of teacher. The co-founder of West Branch, the co-founder of the Lewisburg Prison Project, the head of the Lewisburg Chapter of the ACLU for more than twenty-five years, Karl believed in the inextricable connection between writing and social justice. He thought us poets were of no use if what was enacted in our poems was not also enacted in our lives. There has never been a more important moment to honor a teacher and writer like Karl. We need poetry; what we say and how we say it is essential to every political struggle facing us in a Trump presidency and in whatever is left behind when it’s over. I learned from Karl that writing alone was never enough—that we need to live our poems, and if we weren’t able to do that, we were either writing the wrong poems or living the wrong life. While Karl was working on The Obstacle, he wrote to me in August of 2014 that the poems were part of the project of all poets now: to name “the latest dirty bit of greed” and to get in its way. In his carefully measured poems in opposition to the Keystone Pipeline, he closes by saying, “For only by standing still/ In the pipeline’s road can/ We stop it, standing still.” In Karl’s last years, he was not as mobile as he would have loved to be, but he campaigned hard for Bernie Sanders in the halls of his assisted living home; he wrote to me about wishing he could join the protests in Nebraska where I now live and teach. So he wrote and thought about the power of standing still, the insistence of not moving. In a March 7, 2016 letter to me Karl said: “So much of my writing life is re-writing.” It made me remember how much Karl Patten taught me about doing everything again—re-writing, re-reading, re-thinking, re-visioning the world as I wished it was. It is, after all, what the imagination is for—for resisting a world that cannot, or will not, see itself other than it is. In the preface to The Obstacle, Karl writes, “This is an old man’s book, not simply because of my age, but because I am taking one last basket to market, and I want to fill it with as many good eggs as I can find.” And there are more than a few good eggs in his final collection. One of those is the poem, “The Fifth Element,” which Karl proposes is a kind of becoming. Becoming is the fifth element. “Who am I?” Useless question. “Where am I going”? The correct one. To be honest, it’s hard to write this; it’s hard to imagine that I will never get another poem or another letter in the mail from Karl Patten—the only person who has even written me a true letter in the last decade. When I became a parent in 2014 and expressed in a letter to Karl how fearful I was about taking on that role in a person’s life, how much I feared “screwing him up,” Karl told me “your son will be ok because you’ll never have a problem being honest with him.” He also told me not to read only “silly things” to my kids, and to learn more about language from them than they do from me. Probably some of the best parenting advice I got, and I got a lot of it. I write this small tribute in the year the poetry community lost some giants—Derek Walcott, John Ashbery—but to me, as an undergraduate who met living poets (or even knew there were living poets) for the first time in college, Karl Patten is a giant. When I went back to Lewisburg to read from my own first collection of poems in 2012, Karl wasn’t getting out of the house that much in those days, but he came to the reading. He sat close to front; he grunted and smiled. And earlier that day, I did his dishes on 3rd Street while he told me how much he loved a book I had sent him by Ilya Kaminsky. He missed his wife, Isabelle, who died in 2006. The house smelled like books. We joked about the trouble he and I might get into if we could manage to get him to an AWP conference. In that kitchen, we were student and teacher, brother and brother, poet and poet. We were writing a poem, imagining the world as we wished it were. Stacey Waite is Associate Professor of English at the University of Nebraska—Lincoln. Stacey’s poetry collections are: Choke (winner of the 2004 Frank O’Hara Prize), Love Poem to Androgyny (winner of the 2006 Main Street Rag Chapbook Competition), the lake has no saint (winner of the 2008 Snowbound Prize from Tupelo Press), and Butch Geography (Tupelo Press, 2013). Individual poems have been published in The Cream City Review, Bloom, and Black Warrior Review, and other honors include: the Elizabeth Baranger Excellence in Teaching Award, three Pushcart Prize nominations, and a National Society of Arts & Letters Poetry Prize. Stacey is also the co-host of Air Schooner, a weekly podcast show produced by Prairie Schooner.